Amuia le tagata o lo’o ia te oe lona malosi; o ala ua i o latou loto ia. Eh. Koe fa a laga kala ga. Oh well. Let’s roll. She sat there knowing very well she was going to be on the plane. But maybe if she got them up to speed, God would work it out. Sigh. Probably not, but hey - worth a try. Ok. Game-plan. We present it to Dad. They do really well considering. I feel like I’m a plaintiff and we’re putting our case before Him (x2 = earthly Dad & Heavenly Father). Unfortunately we’re up against the man who knows me pretty good. “Ordained guardians” – Pastor Iliafi. Wish Mum was here though, she would bat for me. Well, she’d at least ease it over then remind me,. Onosa’i. Usita’i. My guys are looking - almost holding their breath with me. Instinctively I know. Its. About. To. Go. Down. Sigh. Oh well. Nice try y’all. Let’s wrap it up. Aikalo ia. That view really is something special. I’m even going to miss these potholes. Take it slow in certain bends. Can speed it up around there. But why would you want to? She started the day in her nice black dress. Home café hmmm. Tiff liked her coffee. Man, thank God for this crazy powerhouse girl. Staying with her was something funny. Her punk hubby was the older brother I never knew I wanted. My girl cuzzy tag-teamed with him the Christian hustle. She had some mighty dreams and visions. And their parents were amazing servant leaders. Aunty was some special palagi pepelo who knew how to graciously say it straight with the perfect measure of love. So back to Home cafe. Ah yes, standard selfie. Smile love, it’ll be all good. Remember this moment. Next goodbye is with the OG. Original generation. Original gangster. My Uncle Jack. This man. His adventures sounded so awesome and ‘pennies dropped’ with his wise speaking. I love how he reminded me of Nana. Palagi pepelo ae Samoa sa’o a le loto ma le fatu. Cool seeing the kids and everyone round loving on him. To be honest, there were so many of them with the range of ages, I struggled to keep up with names. The cutest tribe if I ever did see one. One time the doc told me to stay home and get rid of a virus/chest infection. I had my causes but Uncle called it straight.. Followed by nervous laughter all round and a confessing blush from me. Ia ua la ia. Note to self. Was it worth it? It came up somehow which family I was staying with this month round. Or what project was on. Next thing on the horizon. He could hear my small complaint and question. Am I meant to put roots down by now? With the cutest smile. Tanned white wrinkles around honeyed eyes. Sitting in his wheels. *drum-roll* -ish. I smiled and laughed. Let it sink in. Paused with him. I’m sure he was thinking of his own hard rock & roll times. Maybe it also included some dancing at RSA, over-time at the office and a beer or two. No doubt some laughs, tears and raised voices with his sister & the like. Man I loved hearing those stories. Sunday lunches ended this way and that. A good laugh, cry, drink and misa. I later found out the Samoan proverb. No moss grows on the rolling stone. Roll with it girl and get to your flight. Ugh. Okay Dad’s on the way just go. Leai la. Denial sinks in. And bad. She kaele’s, faanoanoa and faali’i pulls on her black hoodie jacket & sulu’s the pink ie. Aw bless, Dad asked with his eyes - what happened to the black dress? But says nothing. Eyebrow raise & half smile. Think Dad nodded & gave a secret look,. Light blue waters. Green grass. Slow pace. A culture so beautiful it makes me proud. And ache as I feel I’m leaving where I belong. Standing to check-in. Numb. Closing down, processing. .just staying close to Dad. Remembering God’s word and promise. Follow me. We’ll fish legit. Okay. Wish I could choose the waters and timing but fine. If there’s something on that side of the pond. I got my paddle. Well,. One at least. Le Va kindly gift me a scholarship to study preventing violence and trauma recovery. My precious Mama’s were my reasons. We all have a legacy of loving parents and elders who sacrificed so much to give us better opportunities. So what if there was a small sacrifice of time and income? Right? Seki. The creative portfolio assignment had activities around myself as a professional, the profession and working with others in the profession. It has been awesome but also a little.. kiga. Imagine having to look in the mirror; back on your life, where you are now and where you want to be. Stocktake. Smiles. Tears. Most of all,. gratitude to our Heavenly Father who knows what He is doing. And has the golden patience only our Lord Jesus could have. At the first Le Va dinner I met a lovely young woman from Samoa with similar interests. I always remember her telling me that her sister had struggled for years with her mission heart and where God called her to. I remember thinking/praying [before I could stop myself],. Lord, don’t let me wrestle for years with the mission you give me. Snapped. Fast-forward to A&E and I’m about to use the bathroom. First migraine apparently. I pray, Lord, I’m ready to go to Africa or Asia – where ever the mission is. Samoa. Mental Health & Addictions Sector. Youth. Eternal perspective. Legacy in Gabriel’s Gates. Thank you Mama Palepa. She sat with a crown of white hair folded elegantly on top of her head. Ready to catch her flight. Almost. She said that she had only coloured her hair once in her 40’s. Then she submitted to the natural order of things. Brown/black, grey, white. After Dad bought her coffee and my brekkie, he suggested he buy her some magazines. For the wait. Her proud knowing smile and cheeky smirk after I held her hand in prayer. 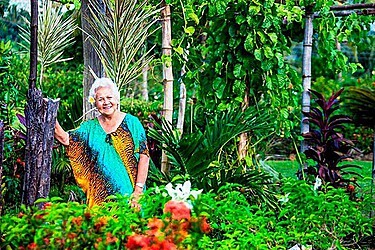 Toe feiloa’i Mama Moore. My Samoa. My Jerusalem. Soon & very soon. When they walk through the Valley of Weeping, it will become a place of refreshing springs. The autumn rains will clothe it with blessings. They will continue to grow stronger, and each of them will appear before God in Jerusalem.